The University of Michigan-Flint is proud to serve student veterans. 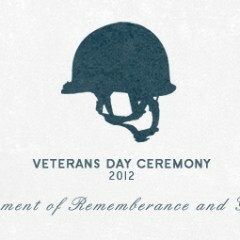 This month, we honor the men and women of the armed services with two special events for veterans and their families. – This year’s program will include a “Tribute to Dallas Mossman.” Mossman was a prisoner of war in the Korean Conflict, and has spoken at the observance a number of times in past years. – The Keynote Speaker will be Stuart Billey, Commander, District 10, Dept. of Michigan, Veterans of Foreign Wars. – The University of Michigan-Flint Chorale will perform a variety of musical selections. 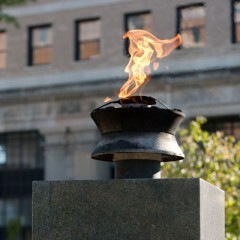 – As is tradition, the program will conclude with the group being led by a bagpiper Lynn Lebeck, PhD., to the Veterans Memorial Rock located at the tip of the horseshoe drive in front of the UCEN (University Center). In recent years, UM-Flint has made it a priority to do more to help the men and women who serve in the military meet their educational goals. The university has put into practice a comprehensive plan to serve student veterans, whether they are on campus or on active duty. The hiring of two staff members assigned to assist student veterans with governmental paperwork and enrollment processes as well as establishing a fully-functioning Student Veterans Resource Center have been key to this important initiative. The Student Veterans Resource Center provides veterans at UM-Flint a place to gather, receive support, and work with staff and faculty on a variety of issues and initiatives. A faculty advisor with a military service record is also part of the Student Veterans Resource Center. The initiatives of the Student Veterans Resource Center provide student veterans with a safe and hospitable environment in which they will receive academic support and transition services to facilitate a successful college experience. 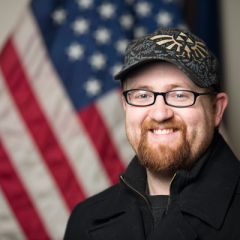 UM-Flint student veteran Brandon Aulph says he received help from the Student Veterans Resource Center before being discharged from the military in July 2010. “It was a tremendous amount of help, from assisting with counseling to preparing what I needed to be admitted to the school. They told me what I needed to do, and that has been a major part of my success here,” said Aulph. In recent years, UM-Flint has also actively increased its recruiting of student veterans. Recruitment events have been held on campus for veterans, and recruiters travel to military bases and specialized events designed for recruitment of student veterans. As a result, since August of 2009, UM-Flint receives approximately 40 online inquiries per semester. When a student visits the website they complete the electronic inquiry form. A recruitment coordinator specially trained in veterans’ issues responds within a 24 hour period. Because of its veterans support through many special programs, UM-Flint is recognized as one of the most veteran-friendly campuses in the country. • UM-Flint is home to the Student Veterans of America-Flint Chapter. In addition to the recognitions listed above, the University of Michigan-Flint has been selected to partner with the Tillman Military Scholars program, which provides educational scholarships for veteran and active service members and their dependents. According to the foundation, university partners are selected based on their innovative program support services and proven culture of community for military families. UM-Flint was one of five new universities named by the Pat Tillman Foundation for the 2011-2012 academic year. UM-Flint is the only university in Michigan to receive the designation. There are only 12 total Tillman Scholar campuses in the country. As a result of leadership for student veterans on campus, Chancellor Person accepted an invitation by the Michigan House of Representatives to speak about service to student veterans on May 17, 2011. Chancellor Person explained the processes at UM-Flint that were specifically designed to assist student veterans, and answered questions from lawmakers about what else can be done to provide educational opportunities for military families. Understanding that in addition to student veterans, their families also deserve specialized support, UM-Flint fully participates in the “Children of Veterans Tuition Grant” program. Over the past six years, there have been 48 dependents of the military veterans at UM-Flint accessing the grant program.